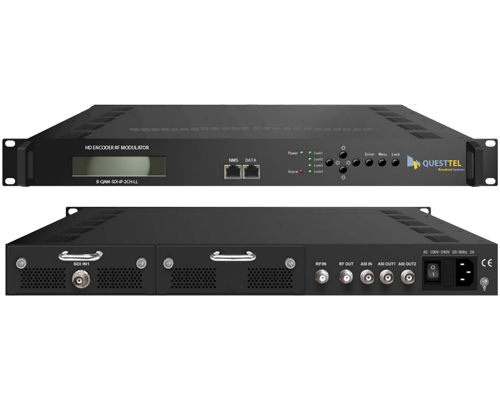 QuestTel's HDMI QAM Modulators integrate high density hardware Mpeg2/H.264 encoder with QAM/ATSC modulator chassis system, which makes B-QAM-HDMI-IP-4CH the best solution for Live event broadcasting and professional Cable TV networking systems. 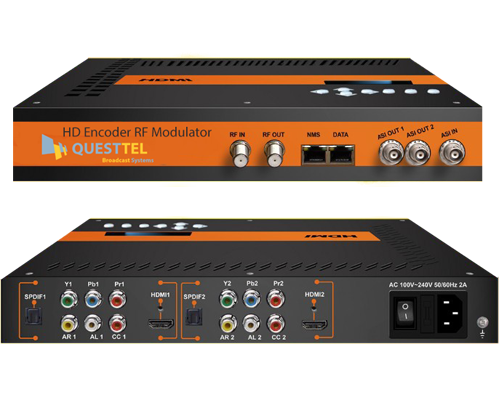 QuestTel's two Channel compact encoder modulators integrate MPEG-2/H.264 encoding chassis with high performance QAM/ATSC/DVB-C/DVB-T/ISDB-T modulator platform, which makes them a perferct solution for hdmi to QAM applications. All-in-one one Channel Full HD Compact Encoder Modulator which integrates encoding MPEG-2, MPEG-4/H.264 modulation to convert HDMI/YPbPr /CVBS signals to digital RF output. 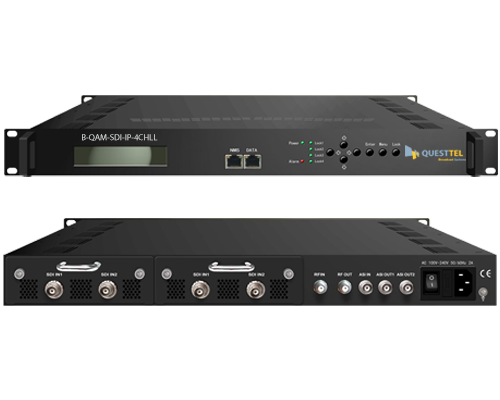 B-QAM-SDI-IP-4CH-LL series products are QuetTel's new breakthrough all-in-one devices which integrate encoding (MPEG-2 HD, MPEG-4/AVC H.264) and modulating to convert signals into DVB-C/DVB-T/ATSC-T/ISDB-T (Optional) RF output. 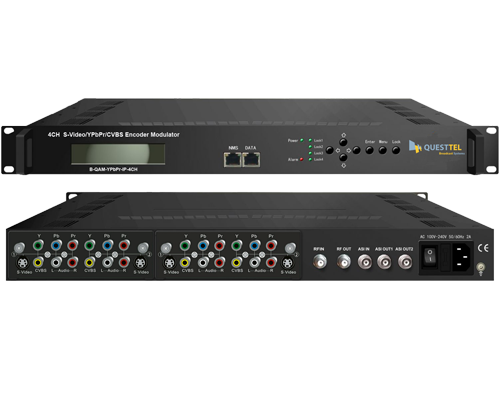 It has equipped with 4 HD-SDI channels input and 1 ASI input and output with 2 ASI ports and 1 IP port. B-QAM-SDI-IP-2CH-LL series products are QuetTel's new breakthrough all-in-one devices which integrate encoding (MPEG-2 HD, MPEG-4/AVC H.264) and modulating to convert signals into DVB-C/DVB-T/ATSC-T/ISDB-T RF output. It has equipped with 2 HD-SDI channels input and 1 ASI input and output with 2 ASI ports and 1 UDP IP (2*SPTS) port. 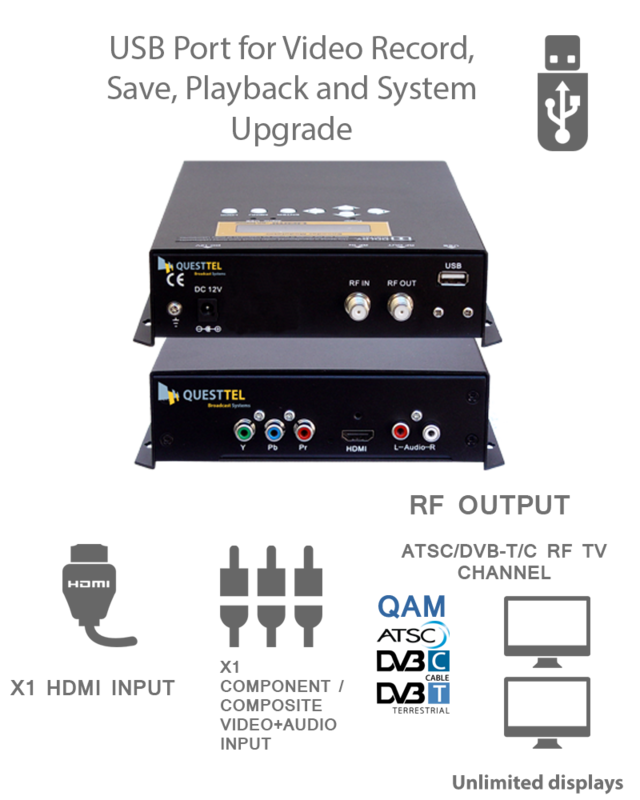 QuestTel's B-QAM-SDI-IP-1CH-LL series products are QuetTel?s new breakthrough all-in-one devices which integrate encoding (MPEG-2 HD, MPEG-4/AVC H.264) and modulating to convert signals into DVB-C/DVB-T/ATSC-T/ISDB-T (Optional) RF output. It has equipped with 1 HD-SDI channels input and 1 ASI input and output with 2 ASI ports and 1 IP port. 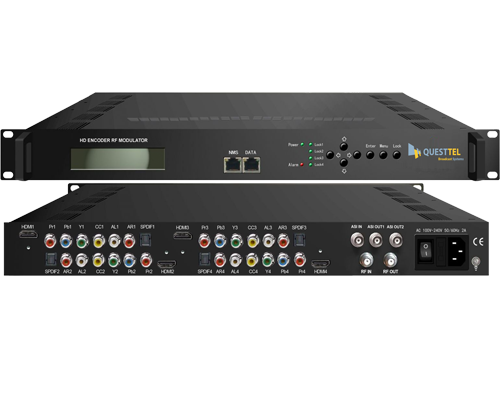 QuestTels's all-in-one 1 Channel Full HD Compact Encoder Modulator which integrates encoding MPEG-2, MPEG-4/H.264 modulation to convert HDMI/YPbPr /CVBS signals to digital RF output. The B-ATSC-HDMI-1CH is ideal solution to distribute HD 720p / 1080i / 1080p Video Signals to an unlimited number of HD Television over the existing coax cables. 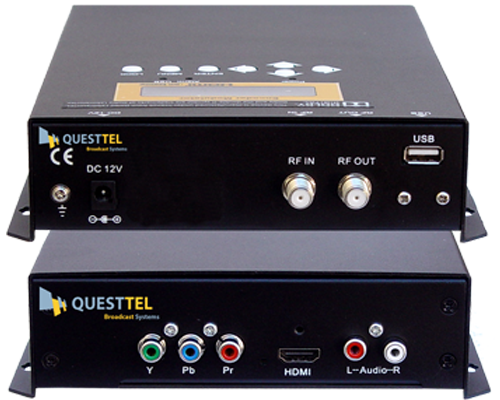 QuestTel Encoder/Modulator capable of modulating QAM DVB-C or DVB-T or ATSC. Also our Encoder Modulator series products are wildly used in public places such as the metro, market hall, theatre, hotels, restaurants and etc for advertising, monitoring, training and educating in company, schools, campuses, hospitals.